Huge liquid black eyes encircled by thick red rings. Light-tipped black bill with perfect white spots at the base. Black hood, red legs and lovely black-tipped wings. And, the tail – the gorgeous white u-shaped tail. The Swallow-tailed Gull is widely considered to be the most beautiful gull on earth. Never in a million years would I have expected to see this bird on my trip to Washington, but let me start at the beginning. Those big beautiful eyes facilitate hunting at night. Swallow-tailed Gulls are the only nocturnal gulls in the world. My friends Phil and Mary Dickinson moved across the country from North Carolina to Washington in December 2015. I expected very few life birds in Washington, but I wanted to visit my friends and I thought that it would be fun to see the Pacific Northwest and a new state. Phil suggested that late August/early September would have nice weather, so I flew to Seattle on August 28. On our first full day, Phil took me to Big Four Ice Caves where I got my first life bird of the trip, Black Swift. I also had an introduction to the beautiful Washington landscape. 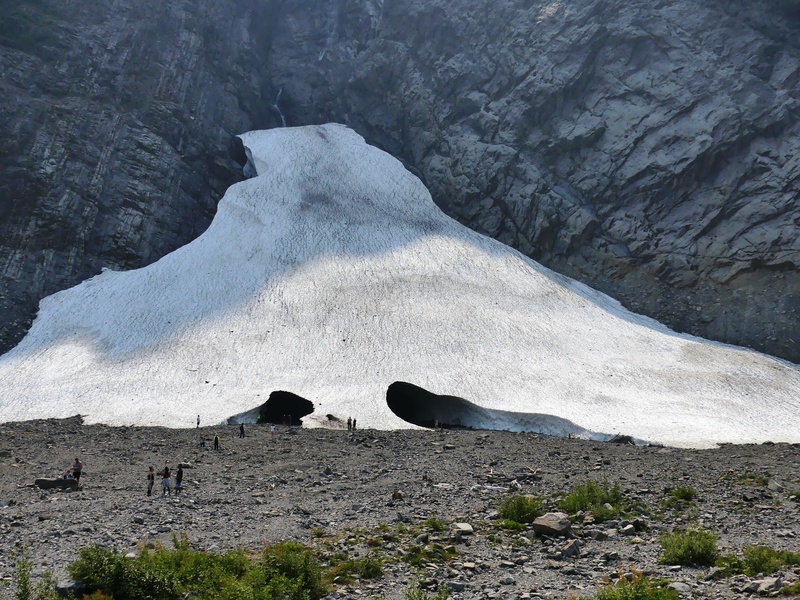 The beautiful but dangerous ice caves. Phil and I heeded the warnings to stay on the trail, but many did not. There have been four deaths there since 1998. 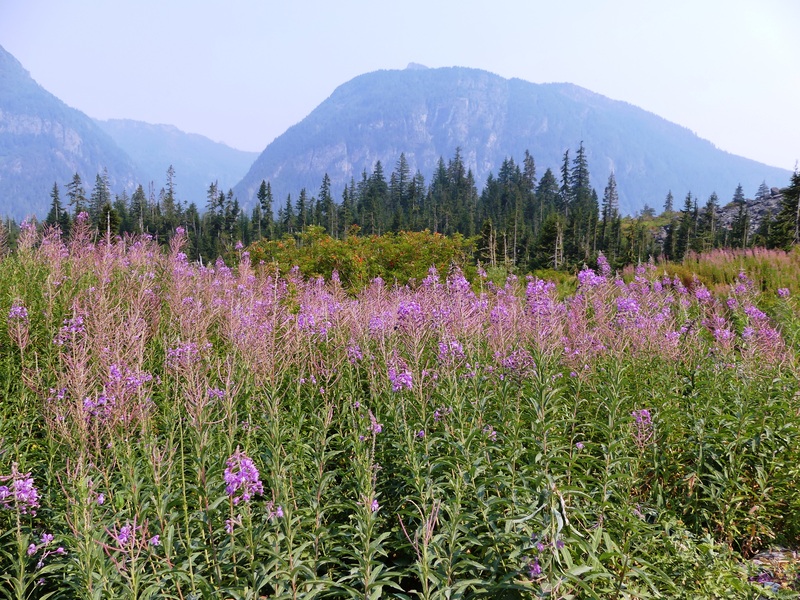 Fireweed at Big Four is beautiful even when past its prime. 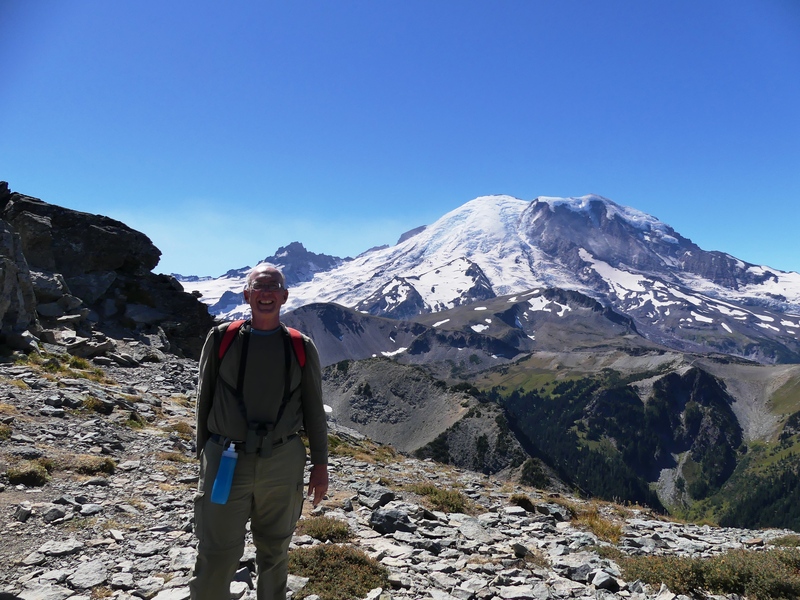 The next day, Phil, Mary, and I drove to Mount Rainier National Park. We took our time with a stop for a picnic lunch and walk at Federation Forest State Park. We arrived at Crystal Mountain Resort mid-afternoon and had a nice dinner after acquainting ourselves with the Sunrise area of the park where we would be spending our time. 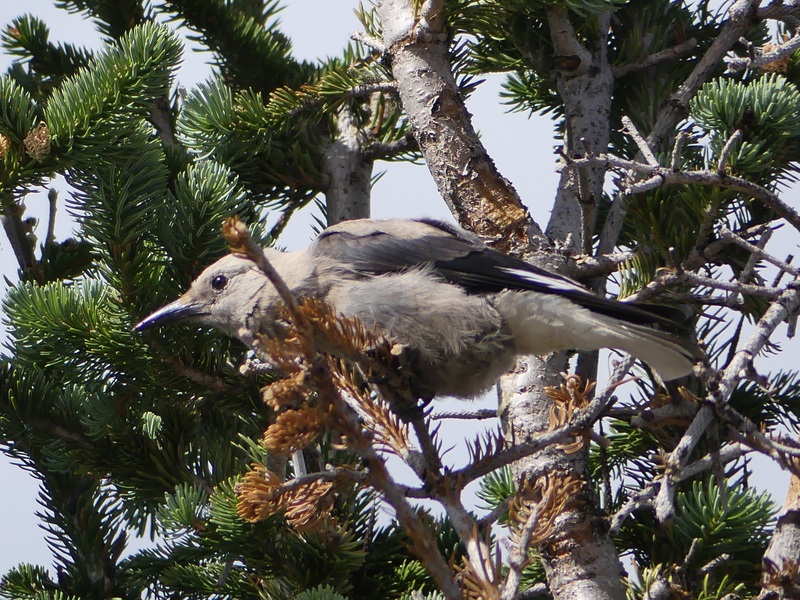 A Clark’s Nutcracker greeted us in the Sunrise Visitor’s Center parking lot. The following morning, Phil met some birders from home in the parking lot just before we started our hike. 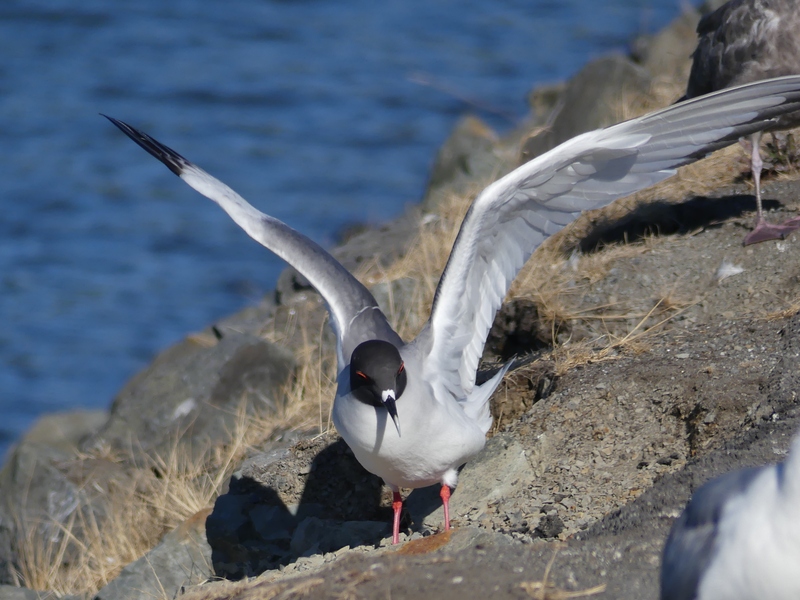 They mentioned that a Swallow-tailed Gull had been found early that morning in north Seattle. I received a text from a friend in North Carolina also notifying us of the gull. What? A Swallow-tailed Gull is a pelagic bird of the southern hemisphere that comes to land only to nest, mainly on the Galapagos Islands. Other times of the year, it cruises the off-shore waters of South America’s Pacific coast from Colombia to Chile. 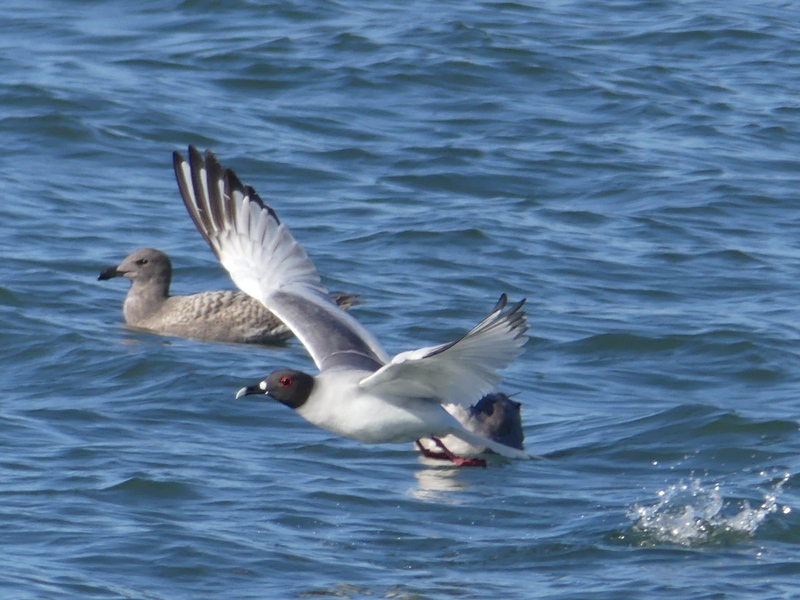 A Swallow-tailed Gull has been seen in North America only twice before, and in California, not nearly so far north. This was a mega-rarity! Some crazed birders would have abandoned plans for Mt. Rainier and sacrificed the advance payments we had made for our rooms that night to chase this bird. We didn’t consider that option and hoped that the bird would stick around until we got back home. 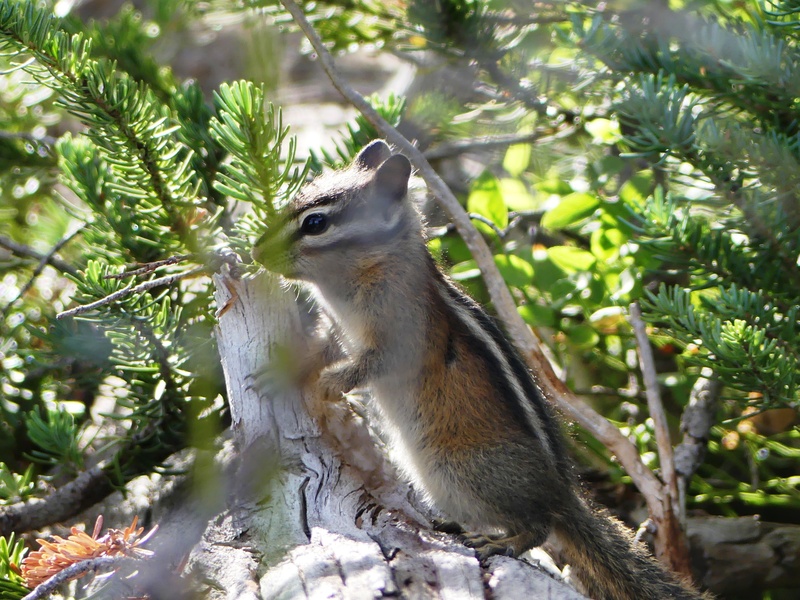 A Yellow Pine Chipmunk posed near the Sunrise Visitor’s Center. One of our target birds on the Mount Freemont Lookout Trail was Prairie Falcon, which had been seen there the previous day. The three of us walked the first mile and a half of the trail, which was labeled “moderate,” before Mary turned back. Phil and I continued on the “strenuous” trail for another 1.3 miles and I soon became scared. Parts of the trail were just a narrow scree path with an abrupt steep drop-off for hundreds of feet down the side of the mountain. Phil was kind, patient and encouraging as I slowly conquered my fears and made my way. Finally, we reached the lookout where we found raptors in the distance, but they turned out to be Red-tailed Hawks. However, Mountain Goats, a Pika, and a feeling of accomplishment rewarded our efforts. Phil and I conquered Mt. Fremont. On Friday morning, Phil and I went out to look for birds before breakfast. We drove to the campground and kept a sharp eye out for grouse on the side of the road, but we did not see any. We decided to check the trail at Sunrise Point, where we were rewarded with a Red-breasted Nuthatch loudly calling as soon as we opened the car doors. We started down the trail and had not gone more than a few yards when Phil said, “Shelley, there’s your grouse.” And, there it was on the side of the trail walking towards us. 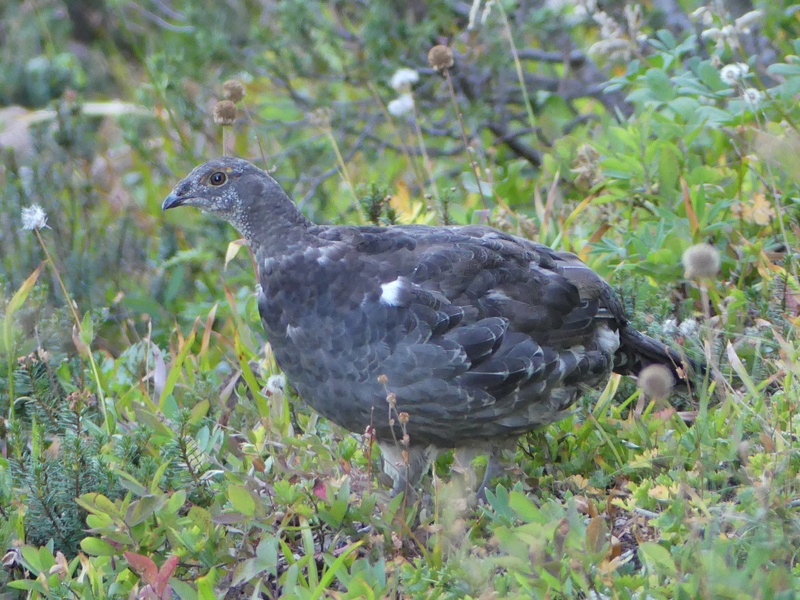 A Sooty Grouse – life bird #2 for the trip! We continued to watch the grouse, an adult male, for 10 minutes as he kept an eye on us, but foraged very close by. Finally, we decided that it was time to go have breakfast with Mary. This male Sage Grouse was waiting for us at Sunrise Point. But, our wonderful, birdy morning was not quite over yet. About a mile from Sunrise Point, Phil spied a woodpecker flying across the road and quickly stopped the car. 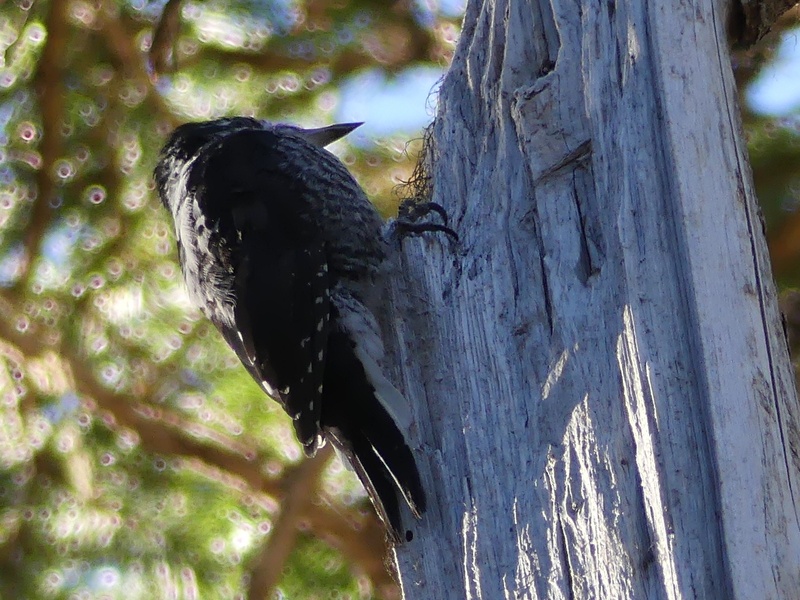 And, then we saw a second bird and quickly realized that it was a pair of American Three-toed Woodpeckers, a species that each of us had only seen once before. The yellow crown on this American Three-toed Woodpecker isn’t visible in this photo, but you can clearly see that he has only three toes. Except for the Three-toed and Black-backed, all North American woodpeckers have four toes. The three of us had a good breakfast and then started the drive home. We had been watching the local birding listserv, Tweeters, and the Western Washington Birders Facebook group for updates on the Swallow-tailed Gull, but as of mid-afternoon, it had not been re-sighted. We started to think that it might be a “one day wonder.” Finally, in the late afternoon, it was found a few miles north of the original location. Reports said that this new location was very difficult to access and required a dangerous and possibly illegal trek across active railroad tracks to get a good look. We hoped that the bird would stay a third day. 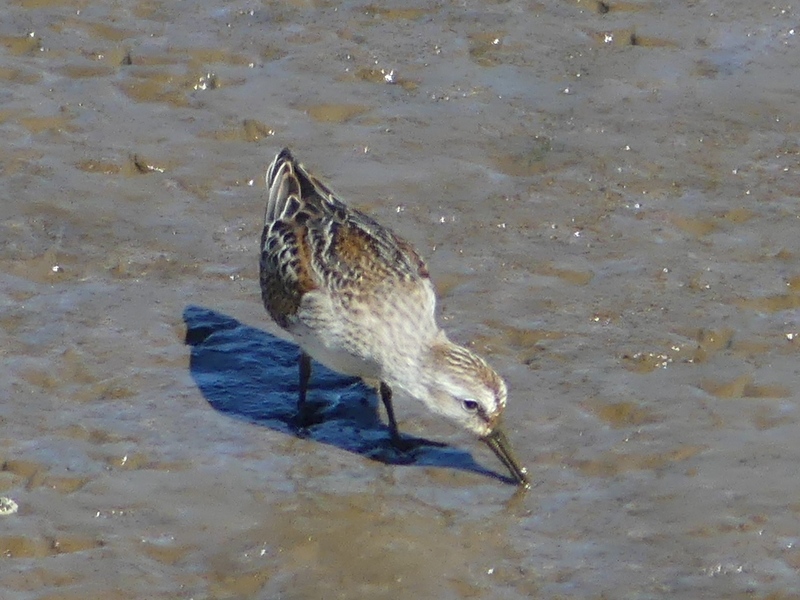 Western Sandpipers foraged at the Everett Sewage Lagoons, some in deeper water up to their bellies. Occasionally a bird would submerge its head completely under water. On Saturday morning, Phil and I went birding in his home county. Again, we watched for news of the gull and were ready for the chase if it was found. We mostly birded coastal areas with a foray to the sewage treatment plant in the middle of the day. After a quick drive-thru at Burger King for a very late lunch, we drove to the Everett marina on the Puget Sound, mainly because we didn’t have time to go anywhere else. I had wanted to get good looks at California Gulls, which are common there. They were there as expected, but one gull was different. 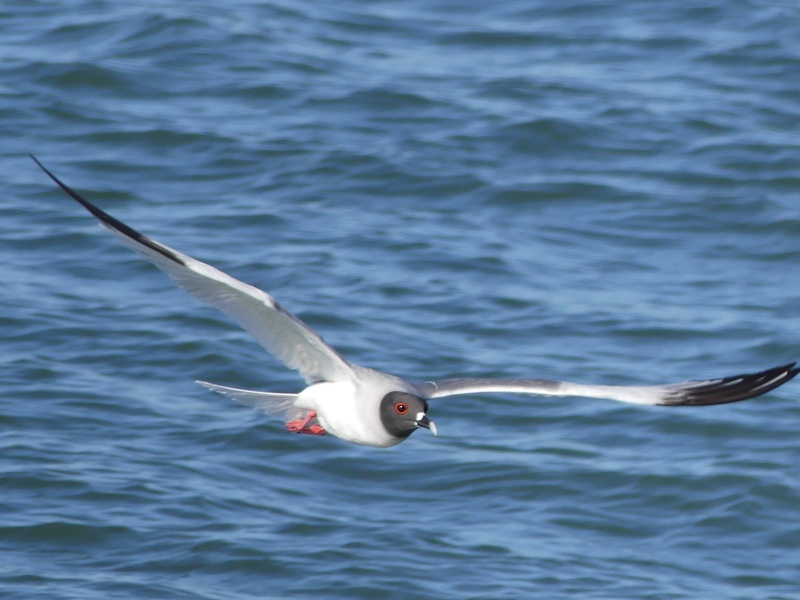 We both felt absolute disbelief as we realized that we had found the Swallow-tailed Gull. 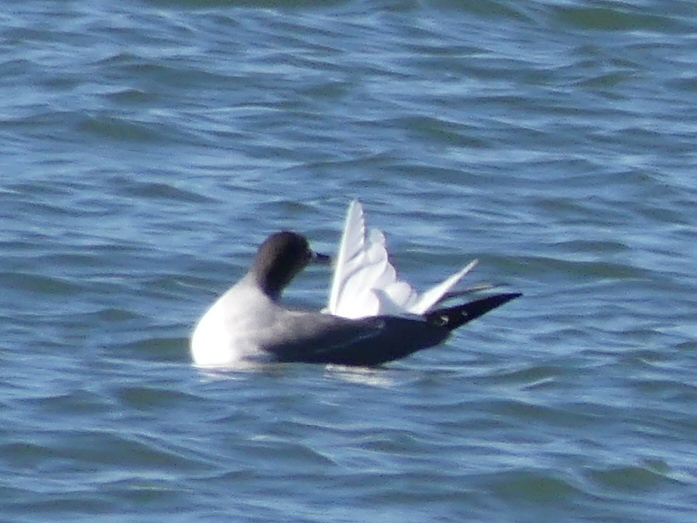 The gull showed off its swallowtail while preening. Phil got the word out that we had found the gull and 10 minutes later other birders started arriving. We continued to watch the gull in close waters, happy with our good views, when the impossible happened. The Swallow-tailed Gull flew right in front of us on the two-foot wide strip of dirt between the parking lot and the water, no more than 20 feet away. We had incredible looks at the bird at it stretched its wings and picked at pebbles. After a few minutes, a truck drove by and the gulls flew back into the water. Courtship includes the male offering the female pebbles for the nest. Hmm. Does this beauty want to make more Swallow-tailed Gulls? I then turned my attention to the small group of birders who had shared this amazing experience with us. I heard someone say that a guy had flown in from Chicago. I introduced myself and the man replied that his name was Amar Ayyash. I don’t know of anyone in North American who knows gulls better or loves them more. If I could have chosen any person in the world to share this experience with it would have been Amar. This gull was a super star and it had also drawn Shawneen Finnegan and Dave Irons from Portland, Oregon. Alex Sundvall had flown in from Minnesota. I’m sure there were others from out of state, too, but it wasn’t possible to meet the 80 or so birders who were there when we left. Others had already come and gone and more would arrive after we went home to celebrate with Mary. 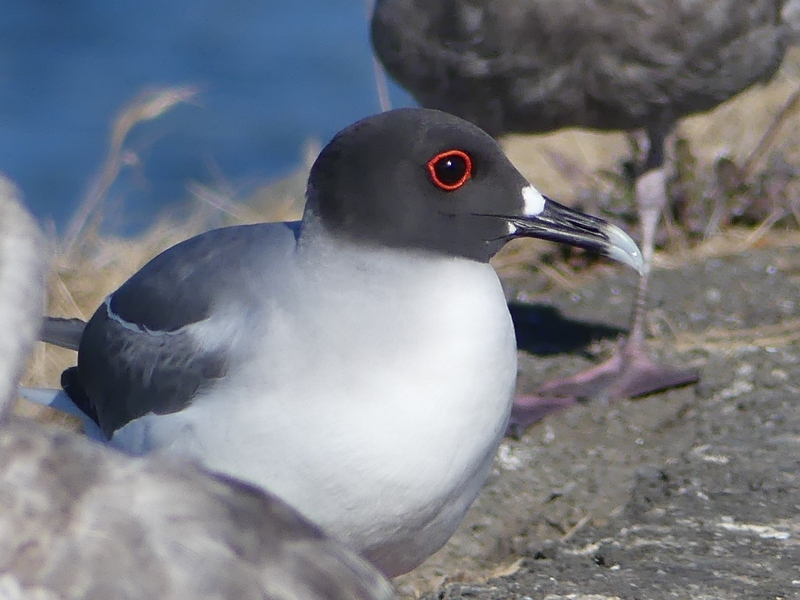 A close-up of the amazing Swallow-tailed Gull in breeding plumage. Outside breeding season, the head is white and the eye ring is black. 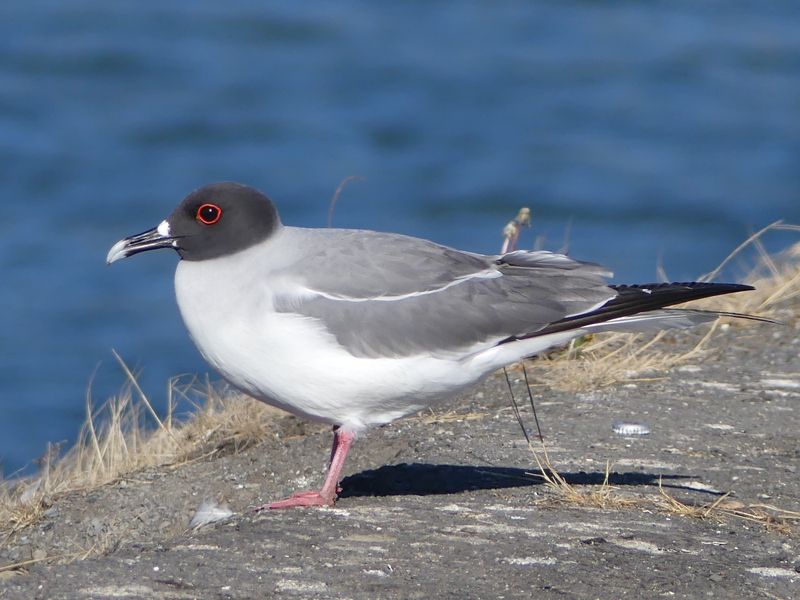 As I write this, the Swallow-tailed Gull is still being seen in Edmonds, about 15 miles south of where Phil and I discovered it. This is day 10. Will it stay longer? Perhaps. Squid, the gull’s primary food, has been plentiful in the area. 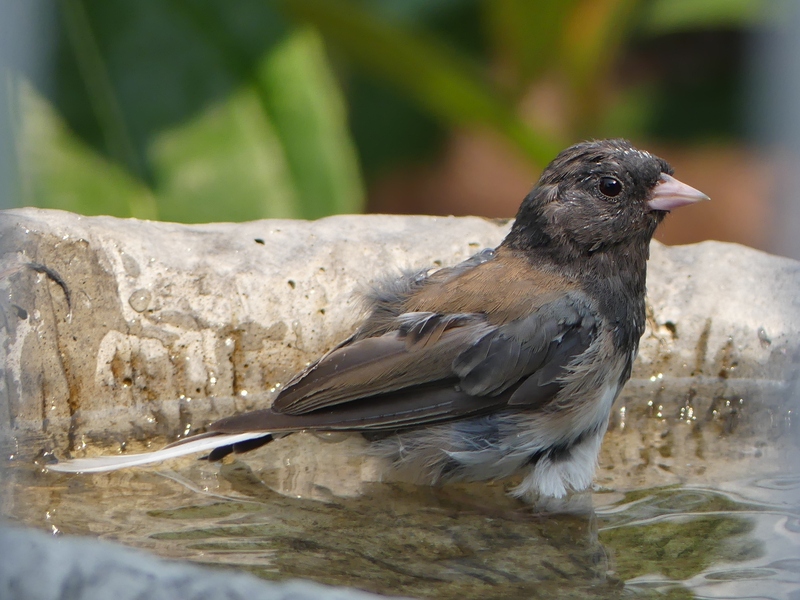 An “Oregon” Dark-eyed Junco cooled off on a hot day in the Dickinson bath while we relaxed on the deck. Phil and I had some pleasant birding for the next two and a half days, but I did not get any additional life birds. Regardless, it was fun to see some of his local birding locations and enjoy the birds in his backyard. Spending time with friends, seeing spectacular landscape of the Pacific Northwest, and the thrill of finding a rare bird will keep memories of this trip sharp in my mind for a very long time. Phil’s story, Beauty and a Surprise Highlight Washington Birding, is on the Forsyth Audubon blog. 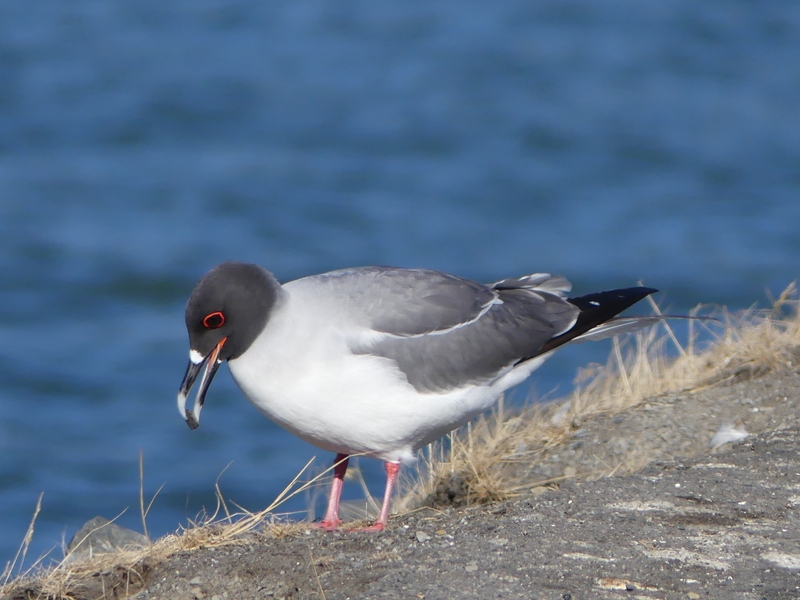 For another fun story and amazing photos, see Amar’s post, Swallow-tailed Gull Twitch, on his blog, Anything Larus. More of my photos are on Flickr in the Swallow-tailed Gull album and Washington – 2017.